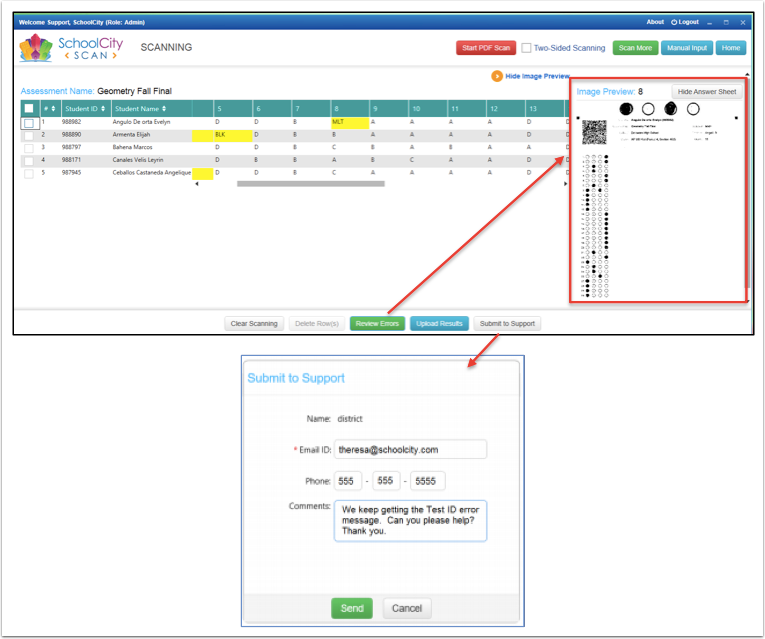 SchoolCity Scan is a non-browser based scanning application that is available in the SchoolCity SUITE. This Windows-based application means no browser compatibility issues. It allows for new features such as bulk scanning (mixed assessments within one scanning batch), student search, manual input screen (if for any reason the paper version will not make it through the scanner), and PDF scanning. After installing SchoolCity Scan, student answer sheets may be scored using a compatible, twain-compliant scanner. Please refer to the help document, SchoolCity Scan: Installing SchoolCity Scan, for information on how to install the application. Once SchoolCity Scan has been successfully installed on your computer, click the SchoolCity Scan icon located on your computer desktop (1a). Sign in using your SchoolCity Suite User Name and Password. User Menu Bar (blue): Welcome, Name, Role, Change Role or School (if available), About SchoolCity Scan, Logout button. Top Menu Bar (white): Bulk Scanning, PDF Bulk Scanning, Configure. Assessment Filters: Year, Collection, and/or Subject. Click Refresh to view results. Assessment tabs: Same as in SchoolCity SUITE Assessment Manager (available tabs depend on your SchoolCity role). Search box: Enter an assessment name and click on the magnifying glass. Assessments List ready to scan. In the Top Menu Bar of the HOME screen, click Configure. The Configure window will open with the General tab in orange (default setting). 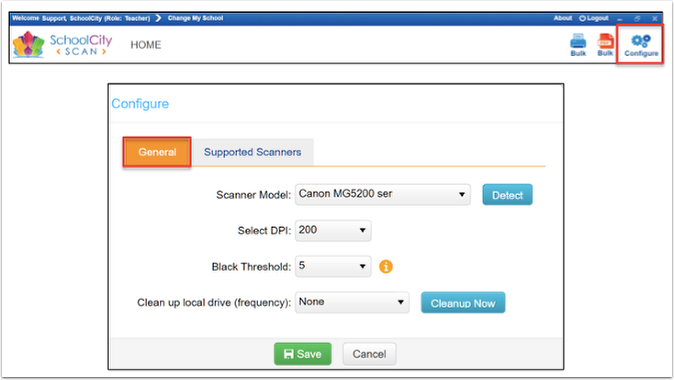 Scanner Model: Click on the down arrow to select the correct scanner, then click Detect. Select DPI: Select 100, 200, or 300. Black Threshold: This setting determines how light or dark the scanning application will read shades of gray. The lower the Black Threshold setting, light shades of gray will read as the color white. The higher the Black Threshold setting, light shades of gray will read as the color black. Clean up local drive (frequency): This will provide the following options: None, Every 4 Weeks, or Every Week. Click Cleanup Now, if needed. Note: Scanned images are saved to the SchoolCity folder after each batch of sheets is scanned. The scan session log files are maintained in this local drive. 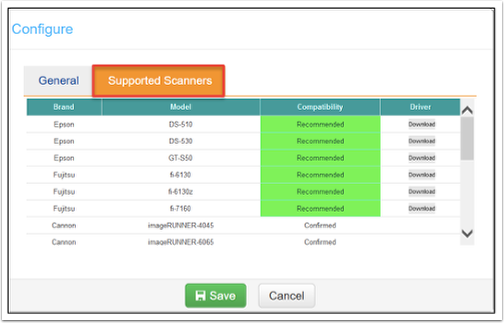 Click on this tab to view a list of supported scanners approved by SchoolCity. Click on Download in the Driver column to download a specific scanner as needed. Use the Filters or the Search Box to locate the assessment you wish to scan. Click on the Assessment Name to begin. 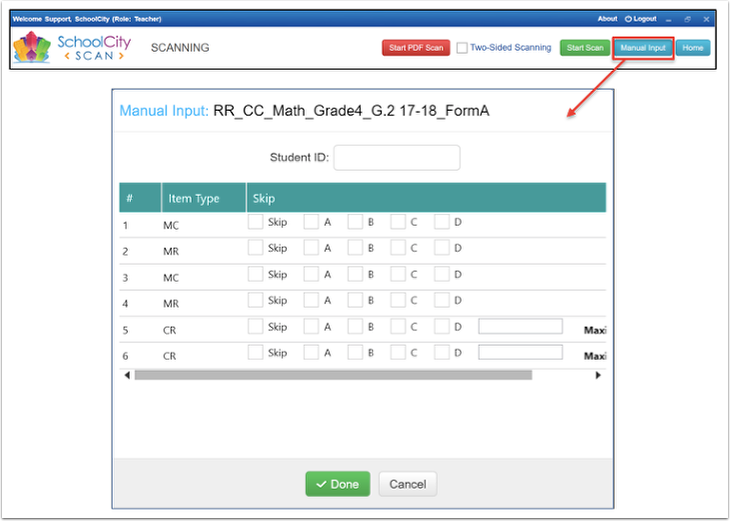 In the Top Menu Bar, you may also select Bulk Scan (blue icon) or PDF Bulk Scan (red icon), which allows for scanning of mixed assessments within one scanning batch. Scan Answer Sheets: Single Assessment Scanning, Bulk Scanning, PDF Scanning, or PDF Bulk Scanning. Single Assessment Scanning: Scan answer sheets for one assessment only. Load Answer sheets in the scanner as directed by your scanner instructions, then click Start Scan. Bulk Scan: Scan answer sheets from different assessments at the same time. - Click on Bulk (blue icon) in the Top Menu Bar. - Click on Start Bulk Scan in the BULK SCANNING screen. - “Assessment Name” will be listed in Bulk Scanning results. 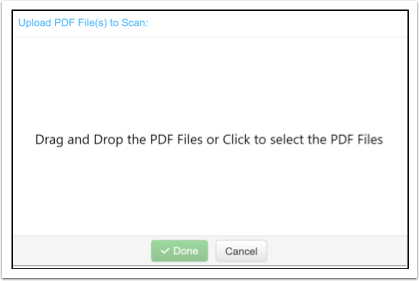 PDF Scan: SchoolCity Scan supports the scanning of PDF files. Once SchoolCity answer sheets have been saved as a PDF file, the PDF files can be imported into SchoolCity Scan for processing. - Click Start PDF Scan for single assessment scanning. - Browse and Upload PDF files, then click Done. Start the scanning process. - Click on Bulk PDF (red icon) in the Top Menu Bar. 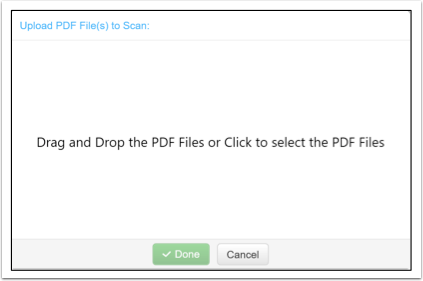 - Click on Start Bulk PDF Scan in the BULK SCANNING screen. - Browse and Upload PDF file(s),then click Done. Start the scanning process. Manual Input: This allows for manual entry of student responses and the ability to enter the Student ID so that scores may be uploaded. - Click on Manual Input. - Enter Student ID, then manually enter student responses. - Click Done to upload results, then click Next to go to the next student. View and Upload Results: The results will appear on the SCANNING screen. The Select Check Box, Row #, Student ID, and Student Name will remain fixed on the screen when scrolling horizontally, left to right. Errors will show as yellow. You have the option to view the Image Preview as well as the Student Answer Sheet in order to compare the results. Click Review Errors to view an Image Preview where you can see the scan sheet. Click the box to the left of the Student ID and select Delete Row(s) in order to delete a row before uploading. 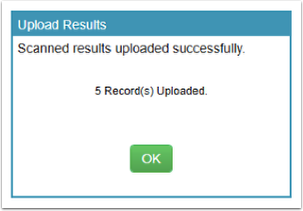 Click Upload Results when ready to submit all results (See Step 8). Click the Clear Scanning button to clear the screen of incorrectly scanned sheets or to clear the screen without having to exit the scanning screen. Submit to Support: If you need help from SchoolCity Support to resolve a scanning issue, click on Submit to Support. Users must enter their Email ID (address) and may include a Phone number and/or Comment to assist our team. Click Send and the application will automatically attach the scanning files and email them to our secure FTP site. Upload Results: Once the answer sheets have been scanned and uploaded, you will receive a confirmation message. Click OK to continue. View Reports: You can now view all reports related to the assessment(s) in the SchoolCity SUITE Report Manager.